Our freestanding small partitions are ideal for creating areas for reading, for quiet or for play. The junior screens are a double sided felt fabric with sturdy feet for added stability and are available in a choice of three heights. You can also select your orientation of either landscape or portrait. 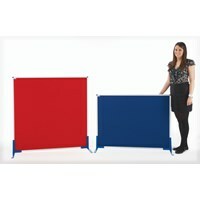 The small partition comes with a choice of five standard felt fabric colours and is fire rated to BS 5867. Optional magnetic whiteboard surfaces on request.